We were lucky that the members of Hubbard Street Dance Chicago decided not to take chances with the minus-40 degree temperatures and the polar vortex in their hometown but arrive early in South Florida for their performances Feb. 2 at the Duncan Theatre in Lake Worth. I wouldn’t have wanted to miss this marvelous group of young dancers who make up Chicago’s premier contemporary dance company. Hubbard Street Dance Chicago impressed me just as they had three years ago when they first visited here as part of the Duncan Theatre’s Modern Dance Series. A small work, A Picture of You Falling, choreographed by talented Canadian dance-maker Crystal Pite, launched the Feb. 2 performance with exceptional artistic verve. This powerful work was first performed as a solo that Pite danced herself. She later adapted the solo into another version – a duet for a man and a woman. In the duet version I saw Saturday night, Pite’s choreography demonstrated both eloquence and pith. Craig D. Black Jr. was completely mesmerizing as he etched out his yearning and conflicted role in his dark and desolate place. Ana Lopez was his counterpoint and together they presented a once intimate but now detached relationship – a duet made of solos that coexisted. The stark and barren mood was greatly enhanced by the lighting design of Alan Brodie who created layers of darkness by criss-crossing the downward beams of lights which he placed onstage in a semi-circle. At one point, a light magically moved across the stage, revealing the silhouette of someone. Pite used a soundscape by Owen Belton of both music and different sounds such as glass grinding and a kind of growling, but it was the dancers’ interaction with the spoken word that added a richness to the complexly nuanced theatricality of the two performers. There was no credit in the program for the author of the poetic prose but the text was paramount to the choreography. The accented voice of Kate Strong became that of an absent character in that dysfunctional place. Hubbard Street resident choreographer Alejandro Cerrudo was responsible for the next two works, Lickety-Split and Pacopepepluto. In both works, Cerrudo chose to set his big and fluid movement to song lyrics. 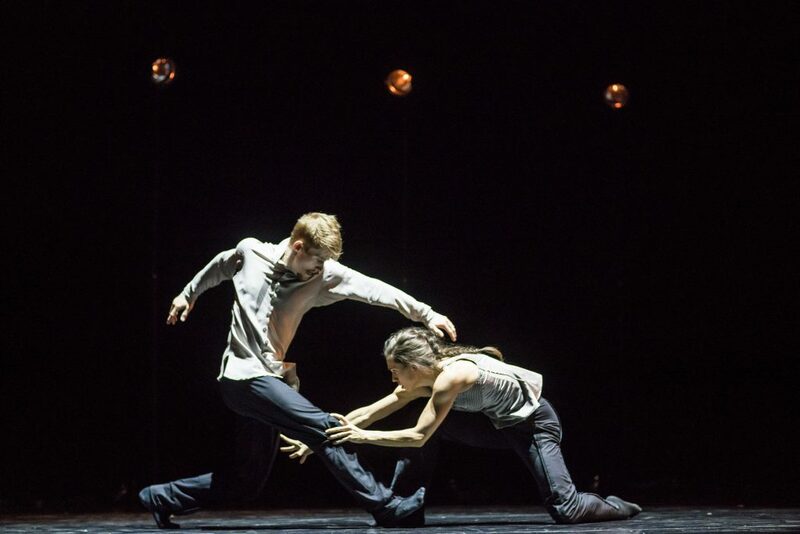 In Lickety-Split, Cerrudo played with gesture and romance using six dancers who subtly interacted, hinting at the complications that love brings. The lush movement was original and full of surprises. The three female and three male dancers danced with such connection onstage making their unison work wonderfully succinct and their partnering magical. The pleasing songs of Bay Area songwriter Devendra Banharts were intermittently spliced with moments of silence where the dancers just continued to move. Lickety-Split was lighter fare, but after the power and impact of A Picture of You Falling, it gave the opportunity to just sit back and enjoy the company at large and the beautiful fullness of their dancing. The program ended with Cloudline, a hodgepodge of seemingly unrelated sections that were introduced and then concluded with the not-particularly-interesting manipulation of a huge billowing cloth by the dancers. Choreographed by Robyn Mineko Williams, a former HSDC dancer, and using a concoction of six contemporary composers including the Latin beats of Jherek Bischoff as well as music by Sufjan Stevens and Olafur Arnalds among others, the work is performed by seven dancers. Despite the fact that it was a repertory show of different choreographers’ works, there was a visual continuity throughout the evening. The dark setting with black drapes and stark sidelights as well as the costuming of varying gray-toned pedestrian wear lent an appearance to the show of an evening-length work. I’m not sure that was intentional. It may have just been the result of the logistics of touring theater but, as I viewed each work, saw they had nothing to do with each another but didn’t flow well from one to the other, I felt let down. Program order is so important. Pull us in, sustain us and leave us high – wanting more. The impact of the first work on the program, Picture of You Falling, was so strong that by the time Cloudline, the last work of the program, ended the program’s momentum had dissipated. The dancers who performed were all outstanding and only represented half of the company. The quality of their work was exceptional. The leadership of Glenn Edgerton, who has been artistic director of the 40-year-old company for the last 10 years, has proven to be both successful and focused. Hubbard Street Dance Chicago, which has a decidedly European flair, excels in presenting exciting new modern dance works created by the best known young choreographers. If this is what you want to experience, it is easy to become a fan of Hubbard Street Dance.